If you can remember, I’ve documented my struggles with weight loss and body confidence a few times on the blog. While generally I have good self-esteem and believe myself to look good in clothes, I know I could stand to lose some weight at time – and let’s be honest. I had a great summer and fall. Great meaning, lots of social times, lots of travel, lots of FOOD. So I was feeling a little on the fuller side of filling out my clothes by the time winter rolled around. 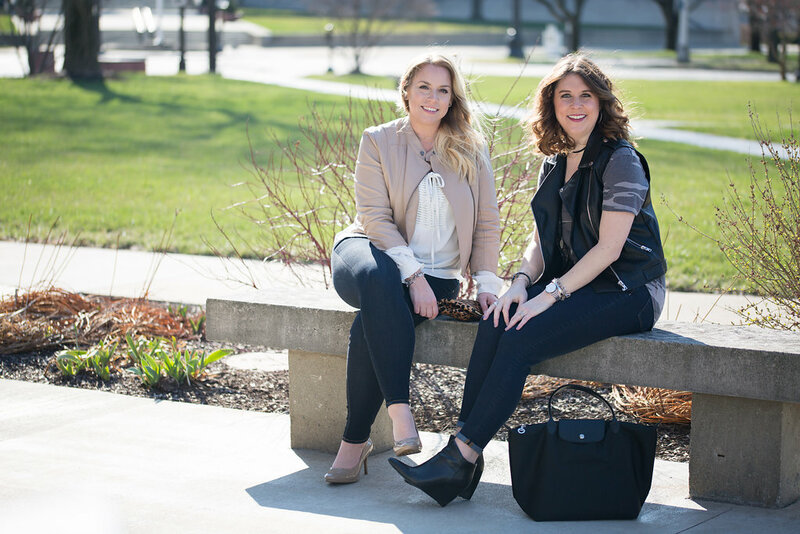 We’ve said it many times on our Social Media accounts and here on the blog, but Holly and I LOVE Blondie’s Salon and Spa. The owner Lindsey went from someone who did my lash extensions every two weeks, to someone I invite over to my house – I love her that much. Not only her, but her entire staff is just so welcoming and knowledgeable. 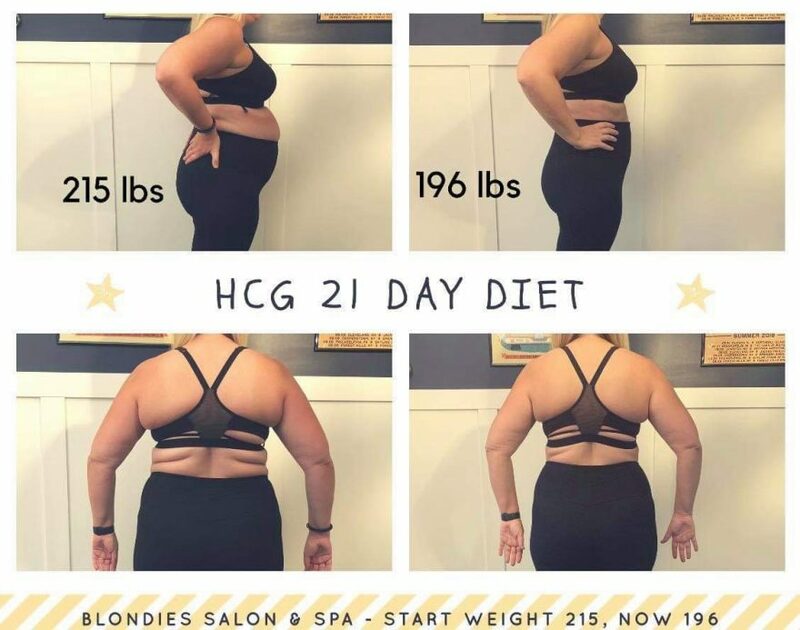 So when Lindsey and Amanda (Nurse Practitioner) approached me about trying the HCG Diet through the Salon, I had 100% trust that this was something I would love. HCG is often referred to as ‘The Pregnancy Hormone’, because that’s basically what it is: when you pee on a pregnancy test, HcG is what the test detects when you get a positive result. The basis of this diet is that HcG resets your metabolism and tells your body to burn fat for fuel. So how would I rate my experience? 100% great and would recommend. I operate the absolute best with extreme restrictions. This is why I have had so much success with the Whole30 diet. Give me a little bit, and I’ll want it all. Know I can’t have ANYTHING, I can stick to that plan. Were there times it was difficult, yes absolutely. But I cheated ONE TIME the entire 21 days. And I was at a work event that I was left with no other choice. If you don’t do well with extreme restrictions, this is likely not the diet for you. I treated this as a jumpstart to a healthier lifestyle. Getting my body in the weight loss mode and giving myself, mentally, the quick results I desired to keep going. In no way is this something I believe to be a diet that can last for more than it’s intended, which is around 40 days. Blondie’s HCG plan is set up for one round being one shot per day for 21 days. The needle is VERY tiny and did not hurt a bit. The best part of the diet came in the first two days. These are called “loading days” and you literally LOAD up on all the things. I loaded on a holiday weekend which was absolutely ideal. Dinner: Repeat cadence of lunch, but change up your product types. While it doesn’t sound like enough food, the HCG shot really does suppress your appetite and I promise you that you don’t go hungry. I know there are many skeptics of the HCG diet because of the caloric restriction, but I did not encounter any negative side affects from eating between 500-800 calories per day. In fact, I experienced the opposite and felt great most days! So – for the good part, the RESULTS! From the start of the first loading day to day 21, I lost a total of 19 pounds. 19 pounds!! The results are very clear in the before and after picture. I dropped a TON of inches! Clothes fit better than they have in months and I really gained a lot of momentum into the next phase of weight loss. If you’ve started the new year with a resolution to lose weight, give Blondie’s a call and get started on HCG to kick start your momentum now! Wow, Robin! Those results are awesome!! I’ve never heard of this method before. Ill have to research it! You look lovely – as always. Proud of you.